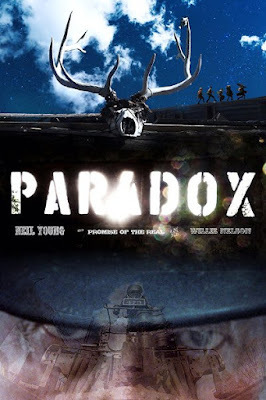 Home / -Watch- / Neil Young / Watch: The Official Trailer for Neil Young's "Paradox"
Watch: The Official Trailer for Neil Young's "Paradox"
Daryl Hannah has released a trailer for her movie Paradox starring Neil Young. Hannah and Young launched the movie at the SXSW film festival in Austin, Texas. “We made this in the spirit of lighthearted fun,” Hannah said. Young said it was “a labor of love. Well, not a lot of labor”. Hannah shot the movie in Telluride, Colorado over four days in 2016 using just a Super 8 and a phone. Paradox will premiere worldwide on Netflix on March 23. A soundtrack for the movie featuring new and original music by Neil Young and Promise of the Real will be released the same day. The Paradox soundtrack is the first of three Young albums on the way for 2018. Next is the live album from the archive series Roxy – Tonight’s The Night, recorded in 1973. A live album from the 2012-2013 Alchemy tour will follow mid-year.